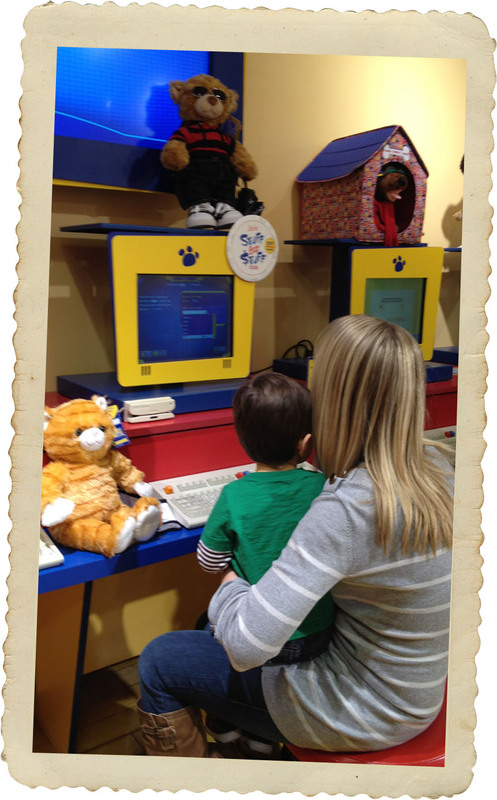 Good news: he was mostly indifferent to the whole experience but didn't hate it. We picked a cat and took him to the girl to get stuffed and get the heart added and all that fun stuff. Sawyer really got into stepping on the pedal which evolved into stomping repeatedly. 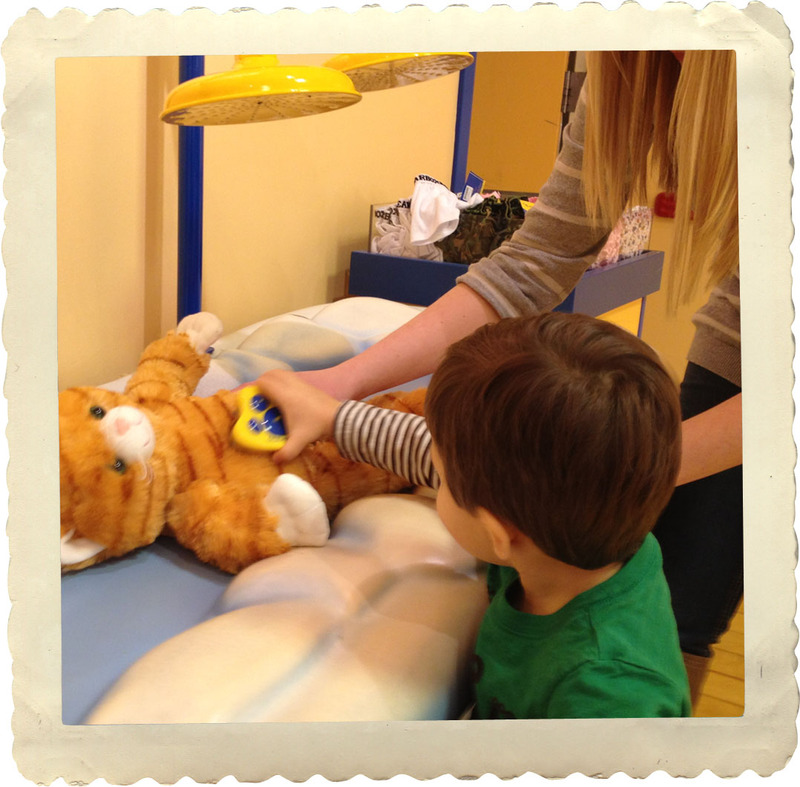 While she was sewing up the back of the cat, Sawyer introduced the new cat to Thomas, of course. 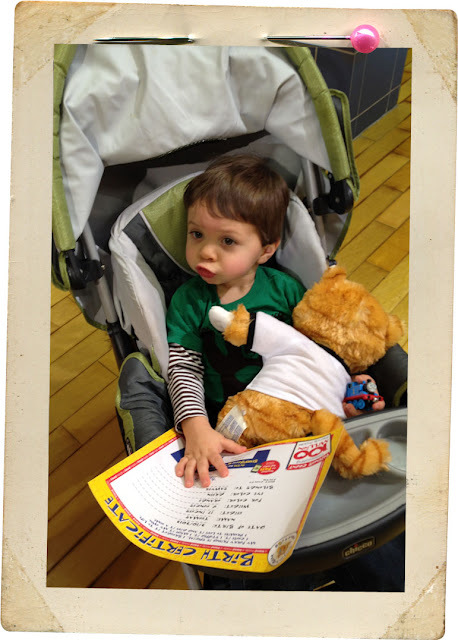 After all, if this toy was coming home with us, it had to know it would always have #2 ranking at best. Onto "bathing" his new friend and getting a blurry picture with me. Thomas makes an appearance again in the picture. Remember, cat, you will always be second place. Last thing on the extraordinarily long list of things to try to get a 2 year old to participate in - naming. I asked Sawyer "What do you want to name kitty?" "Thomas!" Of. Course. So, Thomas it is. I have been referring to him as Tomcat, which makes me feel more clever than I actually am. I overpaid for the thing, Sawyer practiced his duck-face (you know the one all the teenage girls do on facebook), and that was that. 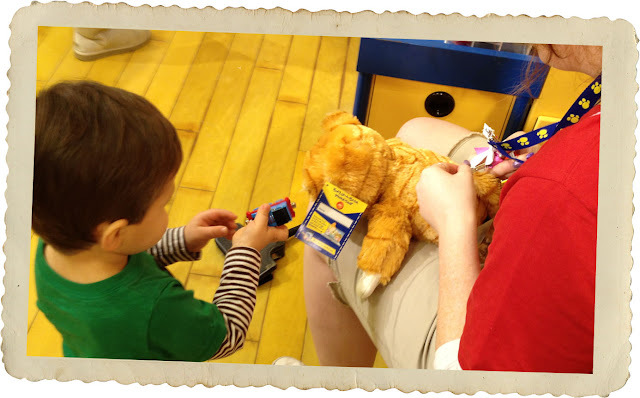 Our first Build-a-Bear experience. In other weekend news, we have taken care of some financial paperwork (yuck), I made a trip to the tailor to have some jeans hemmed, I photographed and finished a guest post for this week, we watched Lady and the Tramp, ate dinner out, and spent the evening with my sister and brother in law. It was such a busy day, but the very best kind of busy. Okay, I too have bought and watched lady & the tramp this week, I also have the shirt you are wearing (JcPenny! ), and I used to work at build-a-bear- all of these things made me smile! Haha! Hey did finally get my e-mail? Check your gmail account girl! haha, I've gone with a good friend of mine to get one of these with her little girl. Pretty sure she was in exactly the same boat as you. Her little one was really not interested at all. 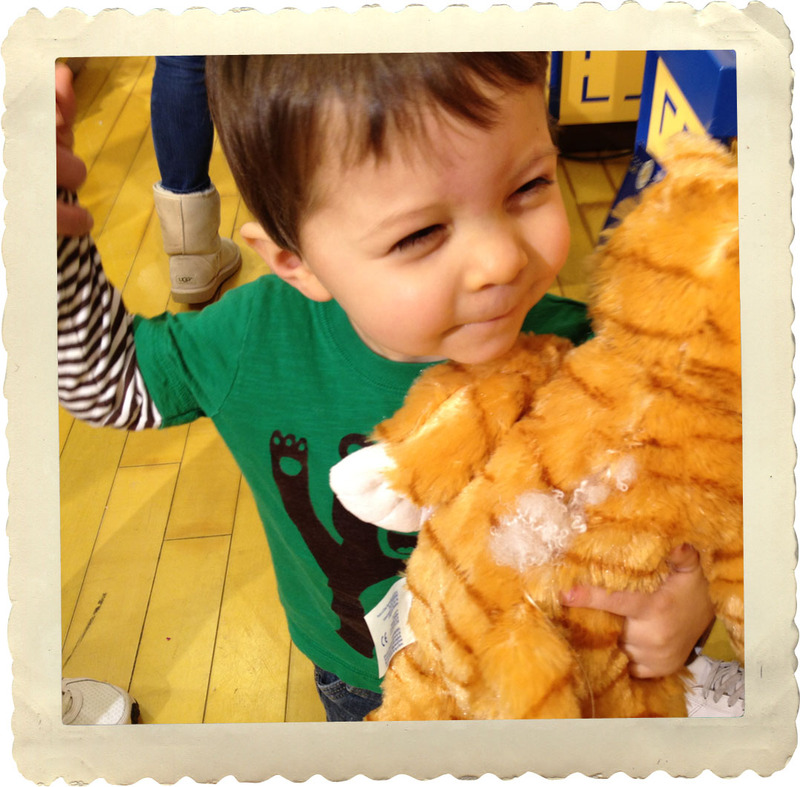 I have a feeling Forrest wouldn't be the biggest build-a-bear fan. He kind of likes stuffed animals, but only for a few minutes . . . he'll hug and kiss them and pat their backs all gently, then turn around and pound them against the wall. It's a very confusing relationship. And it's always nice for new items in the home to know exactly where they stand . . . like in our house, every new toy/object for Forrest is immediately neglected for Monsters Inc. and the all-important blankie. Haha! That cracks me up that he hits them against the wall! I think Sawyer and Thomas would get along well. Trains are king around here, and all other toys, shows, books, etc. come second. 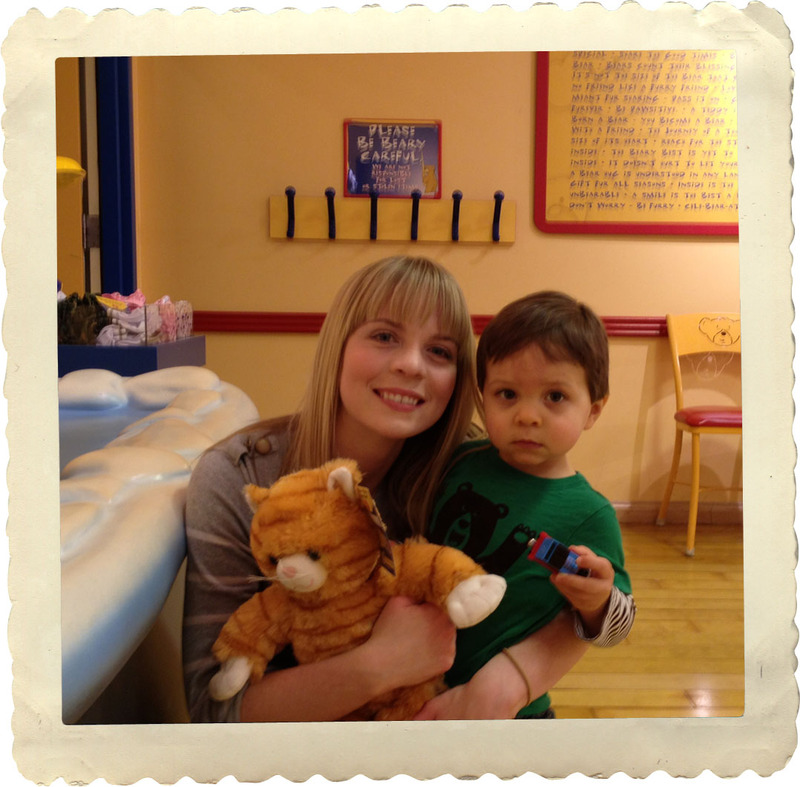 It is awesome that you thought of Sawyer just from a Thomas sticker. Either you really are my stalker or I just mention the Sawyer/Thomas obsession quite a bit. I am going with the second... I mention Thomas a lot on this blog. I should incorporate him into my header.